In the spring of 2012, Disney’s latest block buster, The Lone Ranger, swept into town. More than 400 crew members and set construction builders poured into the area, taking up every available room along the Silver Thread Byway. Not since the silver boom of the 1890s have we been turned upside down like this! A palatable excitement filled the air. Everyone hoped to catch a glimpse of Johnny Depp or Armie Hammer. Movie groupies vied for a sighting of Verbinski or Bruckheimer, who are best known for producing/directing the Pirates of the Caribbean series. Don H. Shank is the founder of the Denver & Rio Grande Historical Railway Foundation, and more recently, Disney’s go-to guy for many set materials required for The Lone Ranger filming. The Lone Ranger, starring Johnny Depp and Armie Hammer, filmed hours of train shots on Shank’s line between mile markers 305 to 311 near South Fork. Edge Performance, a film company that subcontracts for Silver Bullet Productions, can shoot any angle to create special effects. They retrofitted several vehicles with huge rooftop-mounted booms specially made in Russia. Their technologically advanced equipment literally makes a complete 360 degree circle in four seconds! Inside the vehicles, computer operators could see everything shot during filming on live-stream monitors - every angle, every direction - and could rework a scene from the script in seconds. Production shot for twelve hours a day. They shot identical scenes next to the highway where logistics made it easier. 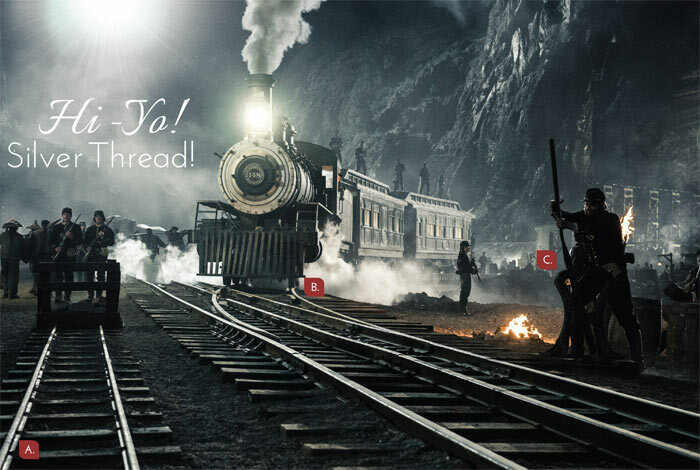 With the magic of special effects and GPS positioning, Edge Performance would merge scenes to look like the actors were actually on a fast moving train along the banks of the Rio Grande. (D) The scene of a young boy throwing the silver bullet to The Lone Ranger (Armie Hammer) was shot in this manner. Today’s Denver & Rio Grande Railroad tours take passengers along the original line General Palmer’s men built in 1883. Don H. Shank founded the Denver & Rio Grande Railway Historical Foundation in 1977 to preserve historic rail lines and equipment, and educate people on how the Denver & Rio Grande Railroad shaped the Upper Rio Grande River Valley! Visit www.denverandriogranderailroad.com to book a ride on this famous line that departs daily at 10:00 a.m. from the South Fork Depot. Specialty tours include the Rail & Raft Tour, where riders can ride up the Rio Grande and raft back down it, a shorter Afternoon Delight Tour, and the Rio Grande Moonlight Tour. Filming At Night - By Judith Stone - When a slug line from a movie script (depicting scene location, time and whether production is shot inside or outside) reads NIGHT- as it did in The Lone Ranger - it means weeks of filming for a one or two minute scene. The difficult task of reversing circadian rhythms and tricking the body to be awake instead of asleep is hard enough. 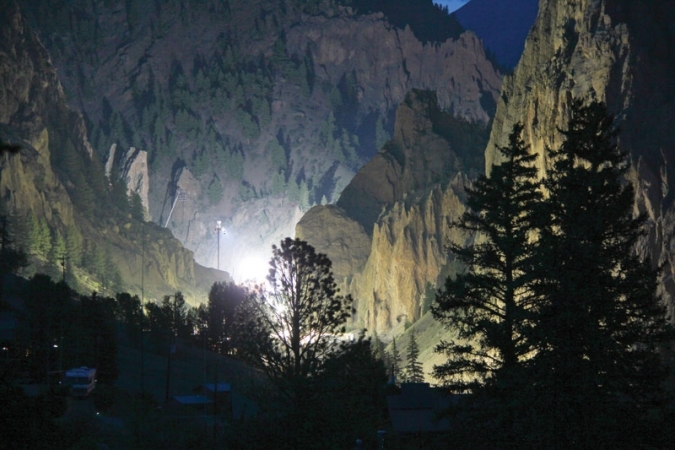 Add together Creede’s high-mountain altitude of 8,799 feet, extremely dark night-skies unfamiliar to crew drivers, and a tight filming deadline. The result? Stressors compound. The road to Creede, Highway 149, snakes along the Rio Grande where plenty of animals meander at night. The pitch-black night skies of the San Luis Valley are perfect for stargazing but terrible for night driving, especially when drivers are used to bright lights of the city. More than one close call was reported with deer, elk, bear and other nocturnal critters, but thankfully, no one hit any animals. Scenes were shot on the rail line near South Fork and in the canyon above Creede. In fact, track was re-laid in locations throughout Willow Creek Canyon originally used by the Denver & Rio Grande Railroad in 1891. Rio Grande Club - Early evening was a perfect time to spot crew and cast members of The Lone Ranger in South Fork during the first two weeks of night shooting. If you moseyed around the Rio Grande Club in June of 2012, you would have seen production cast and crew members working out, swimming, hitting practice balls at the driving range and enjoying the gorgeous views of the San Juans from the restaurant and bar. Director Gore Verbinski and actor Armie Hammer (John Reid/ The Lone Ranger) stayed at the townhomes as did Ruth Wilson (Rebecca Reid), Tom Wilkerson (Latham Cole) & William Fichtner (Bush Cavendish). Armie Hammer and his significant other were often spotted walking to town. Cereal Box Top Treasure - submitted by Jan Thompson, Lovering’s Gallery - When I was 8 years old I LOVED The Lone Ranger, and when my favorite cereal offered a free autographed photo, I quickly rounded up 2 box tops + s&h, and sent it off! After 3 of the longest weeks of my life, the photo arrived! This remained a treasured possession of mine all through the years. When I heard the movie was coming to town, I dug up the old autographed image of The Lone Ranger on his horse, Silver. I scanned it into my computer, and printed out copies to share with friends and visitors to Creede! Mines & Memories & Celebrities - submitted by Ken Wyley, Owner, Mines & Memories General Store - A guy with a British accent came in our store and said a celebrity wanted to come in when we closed. I said we closed at 5:00. After a while a black SUV with tinted windows pulled up and out came Johnny Depp, a friend and a body guard. The driver stayed in the car. They looked around for a while. Johnny was quiet and polite. My wife, Cindy, asked if she could have a picture taken with him and he said, “I would be honored.” I snapped a shot, then Cindy took a picture with him and me. I asked him where he was from and he said Kentucky, where his family had been coal miners, so he understood mining and mining towns. In the movie he was playing Tonto, a character from the Old West, and so he enjoyed flipping through our Creede photos from the 1890s. He looked around and chatted with us for 30 or 40 minutes then bought a few things and left. The next day his driver came in because he wanted to see what we had inside. Johnny, his driver, his friend and his body guard were all very courteous and down-to-earth people. The road going north out of Creede just past the Community Center was closed during the building of the set and the filming of the movie. Johnny at Rare Things & My Night Off - submitted by Roni Turner - When I first heard that The Lone Ranger was going to be filmed in Creede this summer, I was excited! I thought we might meet some interesting people, sell some interesting things, and even possibly meet Johnny Depp! We had been prepping since I had arrived in May to decorate the store and carry products that would appeal to the film cast and crew. By the first of June we had seen several recognizable actors from the movie around town and we were pretty excited when the “big guns” started coming in. There was even a whisper that Johnny Depp was going to come shopping in our store and we were so excited! And then he came...and wouldn’t you know it? It was my night off. Filming Along Highway 149 - The Lone Ranger, starring Johnny Depp and Armie Hammer, filmed hours of train shots on the rail line between South Fork and Wagon Wheel Gap. Most shooting took place between rail mile markers 305 to 311 and/or highway mile markers 10-14. Wolf Creek Liquor Movie Story - Cliff and Beverly Darrow, owners of Wolf Creek Liquors, decorated the exterior of their store with a ‘Lone Ranger’ theme to commemorate the movie’s production. Coors helped by donating a huge banner cast and crew could sign. The Darrow’s wanted to give their son, Specialist Colton Darrow and his unit, the 82nd Airborne Division from Fort Bragg, North Carolina, stationed in Janda Afghanistan in June of 2012, an unforgettable gift. Jonny Depp has been Colton’s favorite actor since he was a child. Cooks, drivers, makeup crew, production crew, and actors from The Lone Ranger movie signed the banner. Depp’s signature is not on it, but hundreds of others are, including Armie Hammer, who plays John Reid/ Lone Ranger. Cliff Darrow reports that The Lone Ranger production crew “was one of the nicest bunch of people; everyone from the crew to the actors were super people and we really enjoyed having them film here.” When the 82nd Division returned home to Fort Bragg, the banner was on display for them to enjoy. 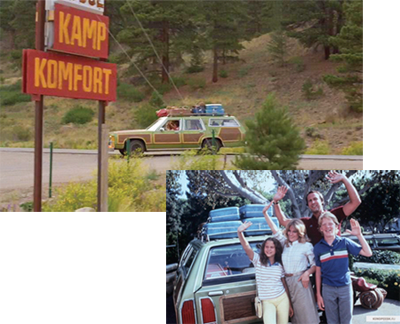 Clark Griswold: We’d like three tents for the night, please. Kamp Komfort Clerk: All right. That’ll be thirty-seven dollars. Clark: Thirty-seven dollars for three tents? Clerk: Oh, they’re very nice tents, and that price includes scenery & wildlife fun! Oprah & Gayle’s Big Adventure took them through Colorado and over Wolf Creek Pass. After a dip in Pagosa’s healing waters, Oprah and Gayle ventured deeper into the mountains. “I have to tell you, if you haven’t seen Colorado, you have not seen America,” Oprah says. 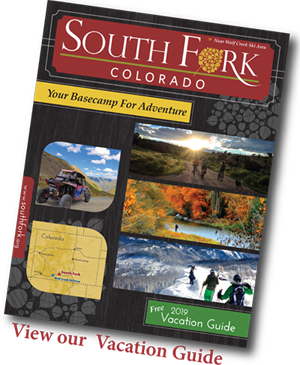 “There are some breathtaking views.” As they passed through South Fork, Colorado, everyone got out to take a nice long view of the stunning scenery. “It was so beautiful, I wanted the entire crew in on this Kodak moment,” Oprah says. 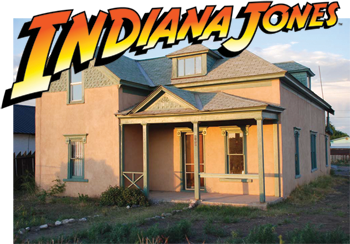 Indiana Jones and the Last Crusade was filmed in Alamosa, Pagosa Springs, Antonito and on the Cumbres & Toltec Railroad in 1989. The most recognizable part of the movie is the circus train sequence. At one point in the movie, Indy runs down 5th Street in Antonito and arrives at his home. Today, movie buffs can book a room for the night here (www.indianajoneshome.com). Where The Hell’s That Gold? 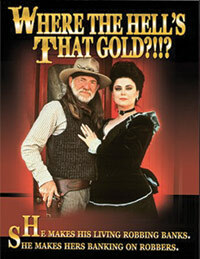 Willie Nelson stars with Jack Elam, and Delta Burke in this movie about two outlaws on the run after stealing and hiding a large amount of gold. Many scenes are filmed on the Cumbers & Toltec Railroad and in the southern part of the San Luis Valley.